I posted a picture of my breakfast yesterday that was topped with bee pollen and had a few questions on this superfood. Here is the BUZZ! nBee pollen is a superfood that is amazing for energy. I use it to top my pre-workout energy smoothie bowls and like to add it to energy balls/bars too…check out the recipe below. 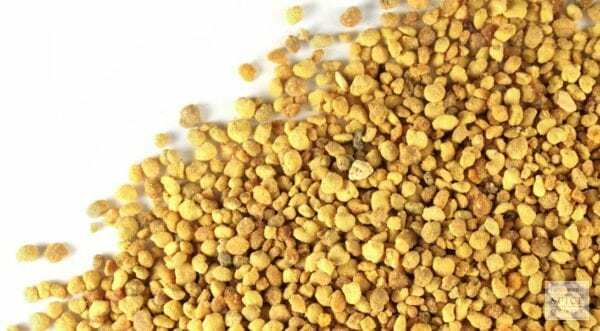 Bee pollen is collected by bees from male seed flowers, mixed with bee secretions and formed into granules. A highly bio-active, tonic nutrient, bee pollen is known as a superfood. This stems from the fact that it contains more than 96 different nutrients, including every single nutrient that is needed to sustain human life. It is made up of 40% protein (containing all essential amino acids), nearly all of it usable by the body without any further breakdown or metabolism. The health benefits of bee pollen have been known for thousands of years. It was a mainstay of traditional Chinese herbal medicine, using it to increase energy and libido, fight acne, aid in indigestion, assist depression and help improve blood pressure. Bee pollen combines 22 amino acids, vitamin C , B-complex and folic acid, polyunsaturated fatty acids, enzymes, and carotene – all of the major antioxidants that have so far been discovered. In addition, bee pollen benefits your body with a number of vital trace elements that it can’t manufacture, but needs in order to stay healthy. Those trace elements include iron, zinc, manganese, copper, calcium, magnesium, and potassium – all minerals that have proven health benefits. • Bee pollen is a full-spectrum, rejuvenative food. Athletes have used bee pollen for centuries to help them increase their energy and endurance. Considering the full spectrum of nutrients that bee pollen provides, it is thought that bee pollen will help athletes, who deplete their bodies of necessary nutrients on a regular basis. Pollen is also good for anyone recovering from an illness or injury. • Bee pollen benefits your immune system. Bee pollen contains proteins, mono and polyunsaturated fats, vitamins B, C, D, E, and beta-carotene, calcium, magnesium, selenium, nucleic acids, lecithin, and cysteine, all of which have been proven effective in strengthening the immune system. • A pollen and spore antidote during allergy season, bee pollen helps build resistance to allerges and relieves respiratory symptoms like bronchitis, sinusitis and colds. Because bee pollen contains traces of the substances that can trigger allergic hay fever, some allergists prescribe it to help lower sensitivity to local plant pollens. • Bee pollen helps you to cope more easily with stress. Because it has a full complement of amino acids, essential fatty acids and vitamins that help regulate mood, taking bee pollen supplements can help you control the stress in your life. 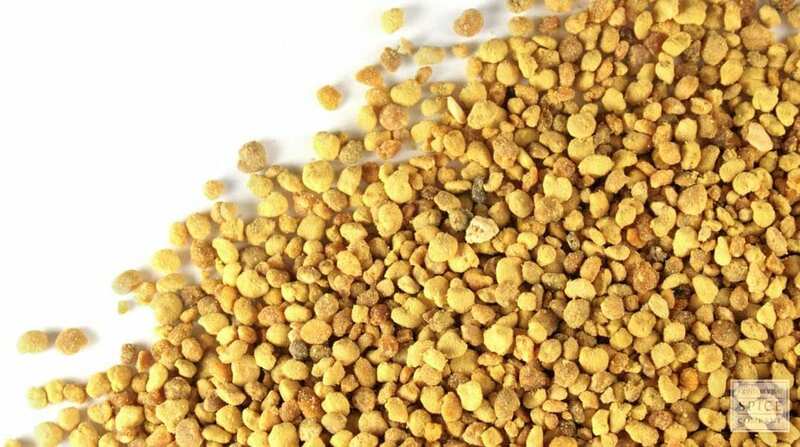 • Like royal jelly, bee pollen helps balance the endocrine system with specific benefits for menstrual and prostate problems. • Enzymes in bee pollen normalize chronic colitis and constipation-diarrhea syndromes. • Pollen may also counteract early aging effects increasing both mental and physical capability. SERVING: Begin slowly by taking just a few granules. Double your intake each day until you are taking 1-3 teaspoons per day. Bee pollen is easily absorbed. Use organic, unsprayed bee pollen. STORAGE: Refrigerate or freeze for long term storage. USAGE: Don’t cook with the granules or add powdered granules to anything that requires heat. Heat destroys the active enzymes and reduces the nutrient value. Sprinkle granules on your oatmeal, yogurt, breakfast cereal or salad. Add into raw truffles. Add into a smoothie. Powder an ounce or two of granules and add cinnamon to taste. Cinnamon adds a delightful spiciness and aroma to the sweetness of pollen Stir powdered granules into vegetable juices, or even into water sweetened a little raw honey. Whirl the powder into salad dressings. Sprinkle whole or powdered granules on toast topped with a nut butter. Great pre-workout! These offer an amazing zing of energy and refreshing flavor! Grind the almonds in a food processor to the consistency of a medium meal. Add in the rest of the ingredients and pulse into a dough-like consistency. Roll into 1 1/4 inch diameter balls and roll in additional coconut. Allow to set in fridge overnight before eating. To save time, press the dough into a small parchment-lined pan and top with shredded coconut. Refrigerate or freeze and cut into individual bars.